FOR YEARS, MUSICIANS HAVE STRUGGLED TO PERFECT THEIR TECHNIQUE AND MASTER THE PAGANINI CAPRICES. DECEIVING EVEN THE GREATEST MUSICIANS. BY FOLLOWING THE PIECES IN THE ORDER I HAVE DESIGNATED, BE ASSURED THAT ANY VIOLINIST WILL BECOME A MASTER MUSICIAN. by playing Paganini's 24 Caprices! THANKS SO MUCH FOR THE BOOK!!! I studied with Daniel Shindaryov for a while when I lived in Los Angeles, so it was exciting to see photos of the two of you together. I began working on them LAST night, and am really excited about this! Thanks again for the book -- it is very exciting to be embarking on this project, and I'm using the fingerings, naturally. Thank you very much. I have just received the brochure. 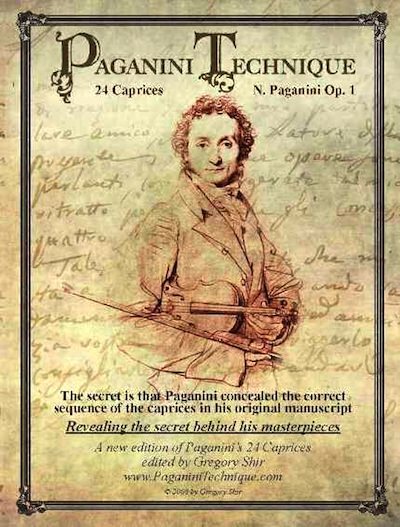 May I ask what is in the PAGANINI TECHNIQUE book? Are there any explanations about the fingerings in each caprice? Or any notes about the key points of each caprice? Or how each teachnique should be practiced? Meanwhile, I am studying the samples. Received the Book Today. I like the fingerings and the Layout.... Great Work ! 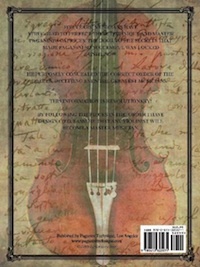 I have read about your new exploration and edition of the Paganini Caprices with interest. Objectively, you do promise a tremendous amount to the diligent violinist. My question for you is this: does your concept of approaching these pieces involve/apply the infrastructure of Paganini’s playing methods, i.e. his way of supporting the instrument and/or hand position and playing posture? I have just received "the paganini technique". Congratulation for your wonderful and beautiful work. Just to make sure i have understood right... Do i have to start with caprice 16 then 10, 22, etc? Would you be so kind to make the issue clearer for me? Interesting your theory about the up bows, I'll have to look into it. I have purchased your Paganini Technique edition and really enjoying it. Could you please advise, in 14th measure of PT 9 (Caprice 16) does the shift to 3rd position happens on B flat preceding D? Yes the shift to 3rd position happens on B flat. Thank you very much for your response, dear Mr. Shir. Shir Dear Sir, I salute you from the city of Guatemala, if not too much trouble if you still wish to have information about the book sale paganini technique, and if you can send to my country, and if I could estimate the time will I get when I book. I realize that I got the bowing all wrong. Yours was absolutely right. I'll correct mine. i have just purchased your book and was wondering how long it would take for shipping to Singapore. I would also like to ask what is the price range for your violins and whether i can view them online. Hello Gregory. I just bought the book from your website and I wonder if is there any information and form of tracking the book throughout its shipping ? Thank you very much. Just got your book, I just hope we can meet in person someday. - Matheus M.
Just received the book in the mailbox earlier this Saturday afternoon. My 10-year old son is really excited about starting to learn the Paganini caprices. I did receive your book and am enthusiastic to begin studying part of your life's work. I just have received the ordered item from you. I think that your "Paganini Technique" poses quite a new approach in teaching Paganini Caprices. I hope it will be helpful in my attempt to master those pieces. If it was, you would have made me a really happy man because I have never had a good violin teacher and the Paganini Caprices have been always living in my dreams and almost completely out of my skills. By the way, your mail was travelling less than one week. I often buy things from the United States, and this was the fastest shipment of an item from California to my country I have ever seen! Got it already yesterday night when I came home from work, thanks. Compared fingerings with the Flesch edition and noted some interesting differences. I will use your fingerings and bowings and go through all 24 pieces in the order you suggest, but it will certainly take some time. Better not be in a hurry. The ultimate goal is to play them in a way that makes a listener regard each one as a piece of fantastic music and not as an example of technical brilliance. 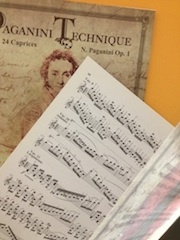 We highly appreciate and welcome your initiative and congratulate for the publication of your "Paganini Technique 24 Caprices" book. Surely, this book will be quite useful for the future violinist generation. We congratulate you again and wish you luck. I took my time to explore all the details of your bowings and fingerings and I like it very much. I also went to your website and I saw the huge work that you did. If I can be useful, it would be my pleasure. Thank you for your message. I am convinced that without enthusiastic people like you, a classical music would have a hard time to survive. Thanks for your response, I'm looking forward to your book. I studied in the order you dictate, but I could only play the first and the second and third are very difficult. I wonder if the exercises are for violinists and advanced or intermediate students can be played. And the other thing is if I can study one day eight, or eight I have to study each day. Thanks for answering my questions. I've been playing that 6 caprices for a while. I think I've really felt the magic of the circle. These two days, I slowed down and practiced for quality because I think I've got skills. The fingerings were so easy to memorize when I really tried to put them in to my brian. Also, I have a big improvement for the cleaness and accuracy for only 2 days. I'm much better than what you saw me before 2 days. I anticipate that I can play at least 12 caprices perfectly for next half month. I really like the idea of your book and I think it should get much more publicity so all the violinist out there can benefit from it. Thanks a lot. - H.H. 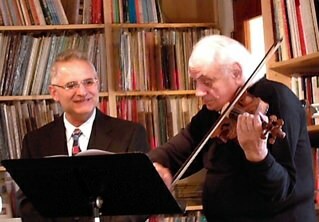 After 40 years as a musician, professional violinist, and teacher of competition winners, I have discovered Gregory Shir’s Paganini Technique. I played and analyzed his technique. His fingerings are absolute – I cannot change any of them to play the Caprices any better. I believe this is an important work for all violinists. This is the key to the Paganini Caprices. If I order 2 copies, is it possible that you dedicate me each copy to me?